Written by Colleen Sedgwick on September 14, 2014 . Posted in Clients. A couple of weeks I taught you how to set-up your Facebook business page. This week, I’m going to give you 7 tips to improve your Facebook page. 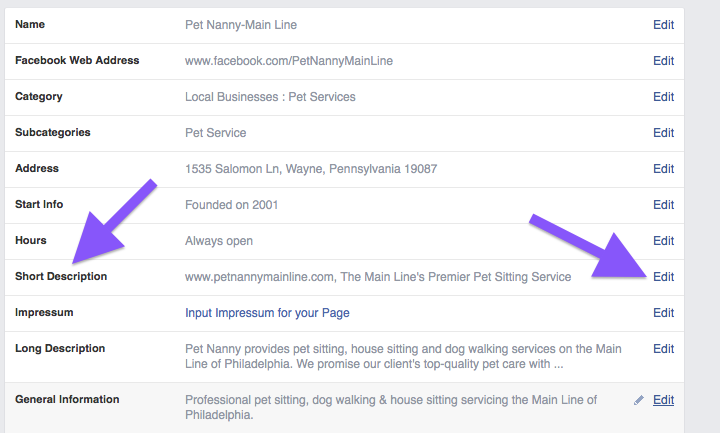 When someone lands on your page, you want him or her to recognize your business immediately. 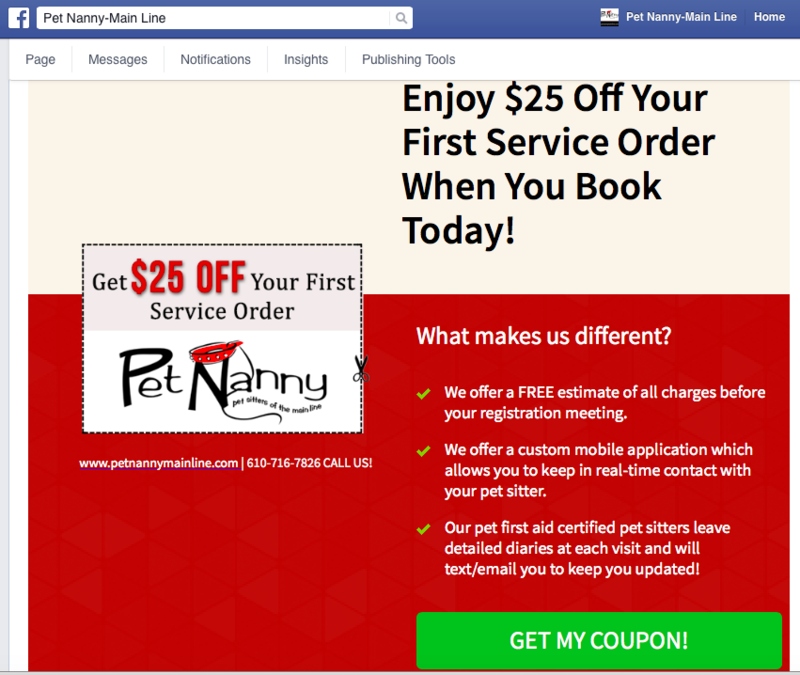 Take a look at Pet Nanny’s current cover photo. You can see I’ve used my logo and a photo of me loving on my pup. Use an image that is at least 851 x 315 pixels. If your image is smaller than those dimensions, Facebook will expand it, which will make the image look blurry. 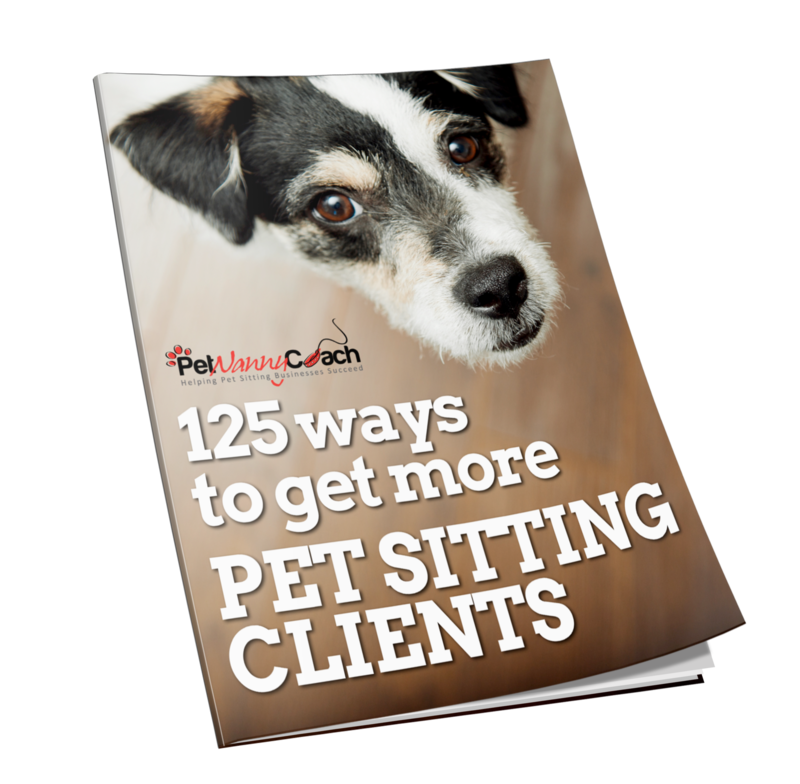 Canva and PicMonkey are some great, FREE tools you can use to create your cover photo. 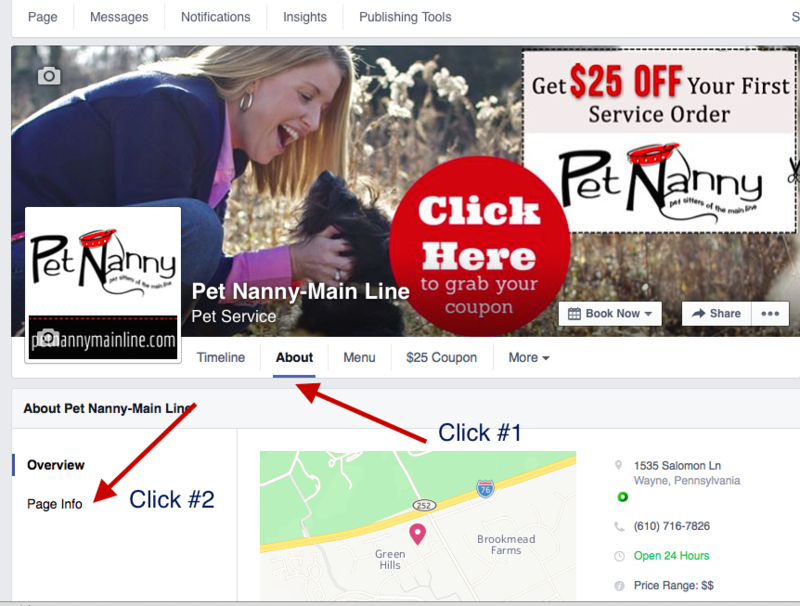 When you upload your cover photo to Facebook you will have the opportunity to add a description and additional information. This is where you add a clickable link to your irresistible free offer or at the very least, a link to your website. As you can see on my cover photo, my offer is a $25 coupon. My call to action is “Click Here to Grab Your Coupon.” When the visitor clicks on it, a light box appears with a link to a landing page where they can opt-in for the coupon. This is the landing page, which is hosted directly inside Facebook, using a 3rd party app. More to come on this in Tip #5. Your profile photo is what your fans will see the most because it is what appears in their Newsfeeds. Use an image that is at least 180 x 180 pixels. It will be resized to 100 x 100 in fan’s Newsfeeds, to 86 x 86 on your timeline and 43 x 43 next to comments. Make sure that it is clear and recognizable in all those locations. 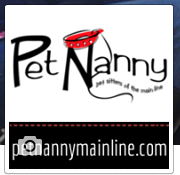 I used my logo and website, www.petnannymainline.com. You can create your profile image using Canva or PicMonkey. Your About section appears right beneath your timeline cover photo. 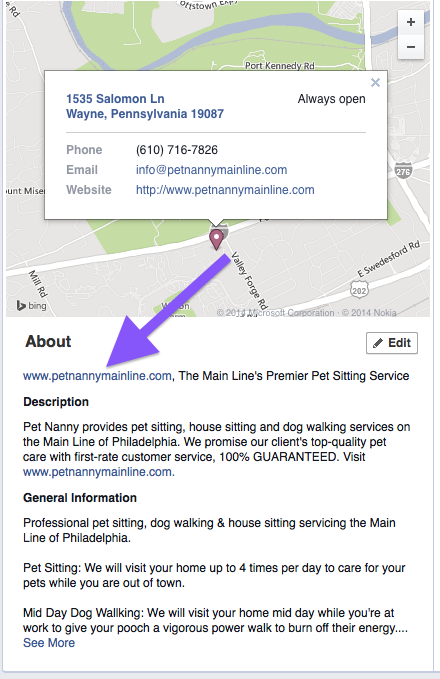 Be sure to include your website URL at the beginning of your short description, so it’s the first thing people see. Click on About under your Timeline photo, then click Page Info. Next, click Edit next to Short Description. Enter your business website url first, followed by a brief description. Now it will be the 1st thing you see under your About section. Woohoo! People feel comfortable inside of Facebook. 3rd party apps allow you to give your visitors and fans the opportunity to get all of the information they’re looking for without having to leave Facebook. 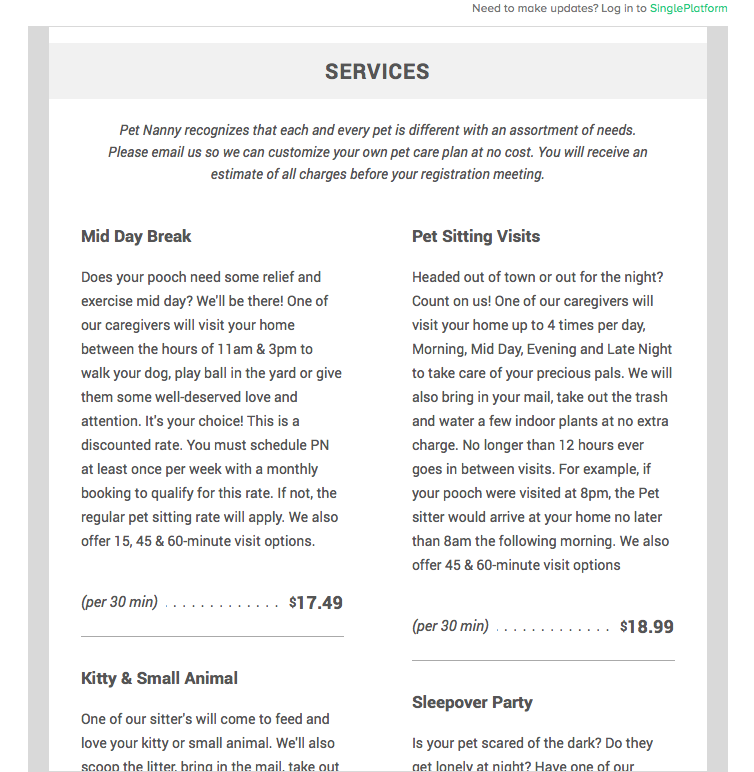 I have used these apps to create what is comparable to a Pet Nanny mini-website right inside of Facebook. They have also given me the ability to collect email addresses. I even have my services and prices clearly listed on my Facebook page. There are many app providers to choose from and most come with free plans with pre-made templates, making it super-simple for even the most “non-techie” person. You could have the best timeline cover photo, profile image, apps and descriptions, but if you’re not posting enough all of that hard work will be for nothing. A good rule of thumb is two posts per day. 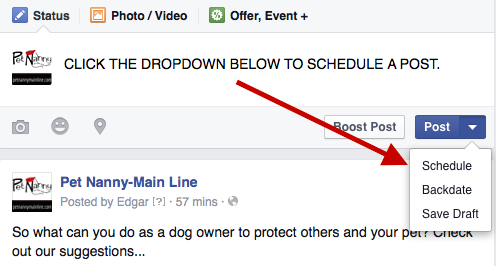 You can use a free tool like Hootsuite to schedule your posts or you can schedule them right from your Facebook page. However you choose to do it, make certain to create a posting strategy and stick to it! Another great tool that I recently started using is Edgar. Social media requires quick response. Be sure to set-up your notification settings correctly, so you can make certain to reply to questions or comments as quickly as possible. Click Notifications on the left-hand side. 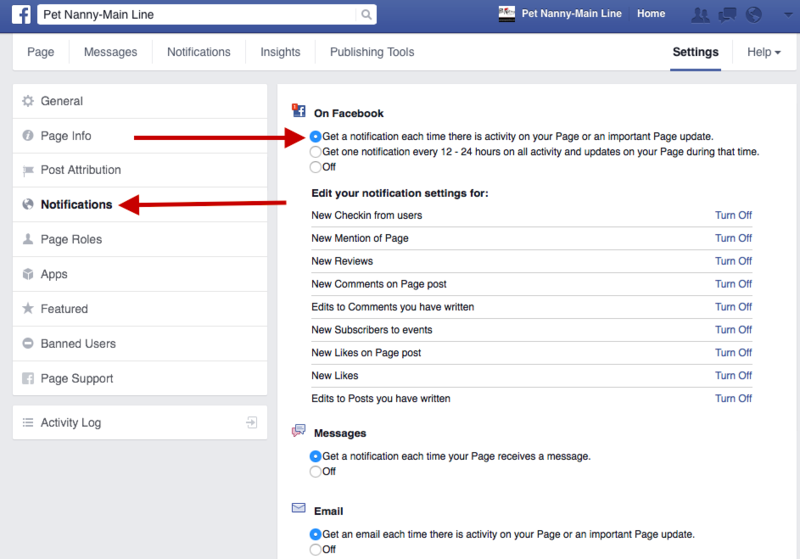 Click Get a notification each time there is activity on your Page or an important Page update. I hope you enjoyed my 7 Tips to Improve Your Facebook Page. Create a branded cover photo. Make your cover photo clickable.